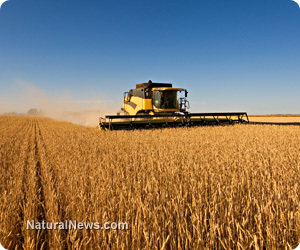 (NaturalNews) News about the GMO contamination of U.S. wheat crops seems to be spreading faster than the GMOs themselves. On Friday, South Korea joined Japan in announcing a halt on imports of U.S. wheat due to the USDA's recent announcement that commercial wheat grown in the USA is contaminated with Monsanto's genetically engineered wheat. Some Americans may still not realize this, but GMOs are outlawed or shunned nearly everywhere around the world. Only in the USA have GMOs managed to avoid being labeled or outlawed -- and that's primarily due to Monsanto's financial influence over lawmakers. All wheat produced in the United States will now be heavily scrutinized -- and possibly even rejected -- by other nations that traditionally import U.S. wheat. This obviously has enormous economic implications for U.S. farmers and agriculture. How much of the U.S. wheat supply is now contaminated with GMOs? "...the mysterious appearance of the Monsanto wheat has raised questions about how the strain traveled there and whether it is lurking in the commercial wheat crop," reports the Washington Post. WashPo goes on to report that Monsanto, "is still testing strains of gene-altered wheat in Hawaii and North Dakota." In truth, nobody knows how much of the wheat is contaminated. Every more shockingly, food companies don't bother testing wheat for GMOs, either! Until now, that is. All of a sudden, food importers all around the world are wondering whether they are inadvertently buying U.S. wheat that's contaminated with GMOs. Consumers, too, are asking the question, "Have I been eating GMO wheat without even knowing it?" These Monsanto wheat experiments, after all, have been taking place since 1998. Is Monsanto lurking in your Wheaties? The real issue in all this, however, is an economic issue. Suddenly U.S. farmers are seeing the kind of economic destruction that can be caused by Monsanto's genetic engineering experiments. Thanks to Monsanto and the USDA -- which approved the open-field experiments -- every U.S. farmer who grows wheat is now at high risk of losing enormous sums of money on a food crop that's increasingly being rejected around the world. This means Monsanto is pushing U.S. farmers toward bankruptcy while harming America's exports and GDP. Monsanto has become a force of economic destruction in America. Will Monsanto reimburse all these farmers who suffer an economic loss? Not without being sued, of course. Perhaps it's time for a nationwide class-action lawsuit against Monsanto, supported by all commercial farmers who hope to be able to protect their crops from market-crushing GMO contamination. Nobody wants GMOs except Monsanto! Consumers don't want GMOs, farmers don't want GMOs, foreign nations don't want GMOs and food companies don't want to deal with the hassle of GMOs either. The only entity that still wants GMO in America is the very company making money off GMO: Monsanto. What's missing from the effort to stop the GMO threat to our food supply?